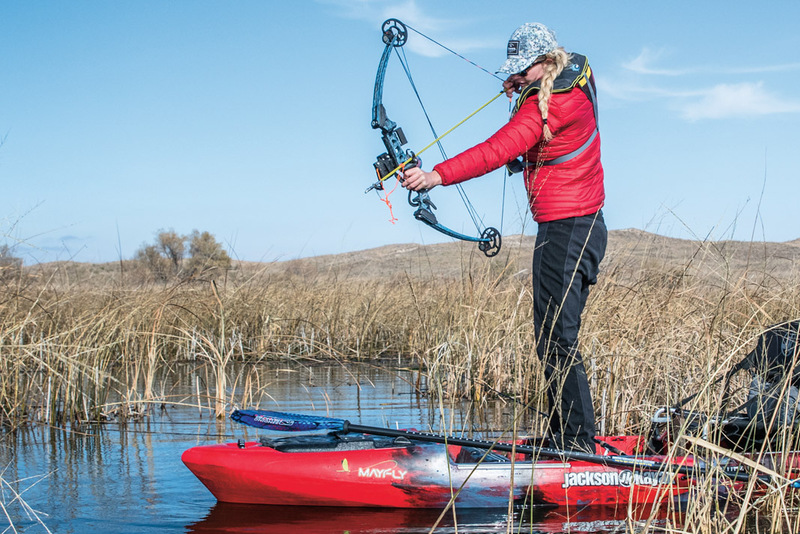 What Does Kristine Fischer Reach For When She’s Kayak Fishing? During a photoshoot last fall in Nebraska, I zoomed in on Jackson Kayak pro Kristine Fischer as she was watching a fish swimming just below the surface. I snapped photos as she leaned down and, instead of grabbing a fishing rod, picked up a compound bow and arrow. I watched through the lens while Fischer took aim, released the arrow and narrowly missed a huge carp. Fischer didn’t hit the fish, but I was struck with the challenge and simplicity of bow fishing from her kayak. Equipment isn’t fancy. Fischer says it’s possible to convert a hunting bow, but heavy draw weight isn’t necessary to shoot a fish at close range. “I like a bow with no let-off so I can snap shoot when I see a fish,” she adds. Fischer debates between carbon fiber and fiberglass arrows. “Carbon fiber is more accurate but brittle and more expensive,” she explains. Fiberglass is a good choice for shorter shots over rocky bottom. The toughest challenge in bow fishing is hitting the fish. It’s hard enough to aim at a moving object while standing on another moving object; bow fishermen have to take light refraction into account. To calculate how much light bends through water use the 10-4 rule. If you’re 10 feet from a fish one foot under the water, aim four inches below the fish. As the distance increases, add four inches for every 10 feet. “Plan to spend time practicing with submersible targets,” Fischer suggests. Bow fishermen target saltwater and freshwater fish and they sight fish during the day and fish with lights at night. Some states have rules against shooting game fish with bow and arrow, so many participants focus on invasive species like carp or nuisance fish such as sting rays. Since shoot and release is impossible, hunters are committed to consuming the fish they kill. Always check local regulations before heading out on the water. 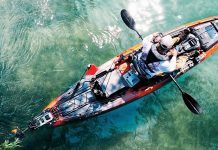 “I like bow fishing from my kayak because I can access areas too shallow and narrow for a motorboat,” Fischer says. She admits bow fishing from a kayak is difficult, but the payoff is a new challenge and a tasty fish in the pot. 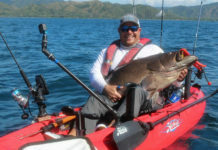 Follow us @kayakanglermag to find out more about fishing skills and expeditions. 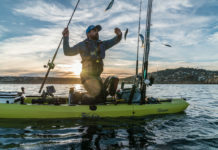 Previous articleWhy Add Side-Imaging Sonar To Your Fishing Kayak?